In a small skillet, heat coconut oil over medium heat. Toss corn tortillas into the pan and fry until golden brown. Transfer to a paper towel-lined plate and sprinkle with salt. Set aside. In a blender, combine enchilada sauce, butternut squash and chicken broth. Puree until smooth. Pour mixture into a large pot and bring to medium-high heat. Add chicken breasts, corn, green onion and diced tomatoes. Cook until steaming. Remove from heat. 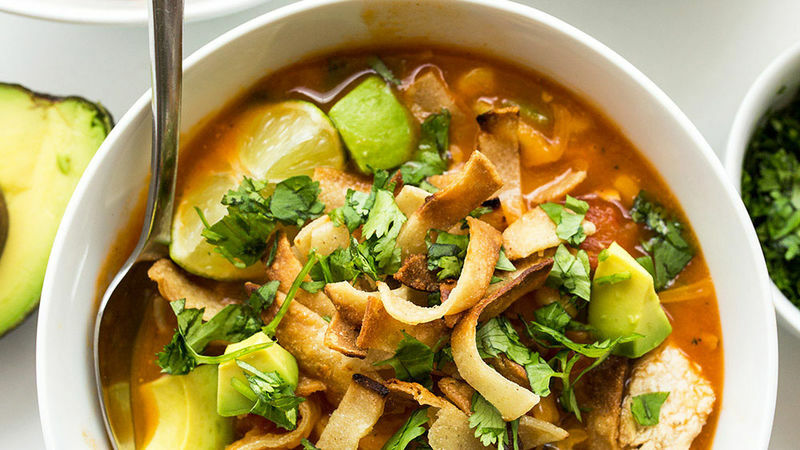 To serve: Top bowls of soup with cheddar, cilantro and tortilla strips. 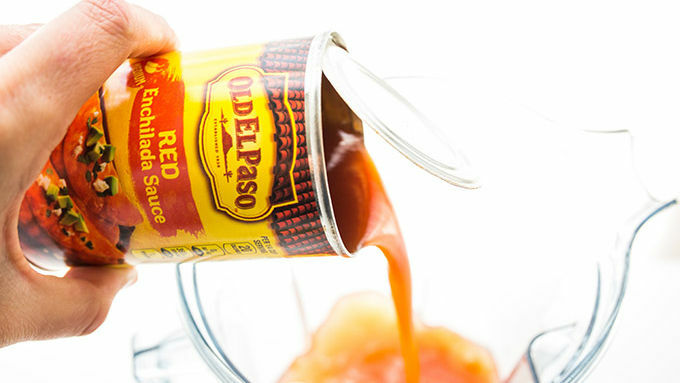 For a bit of kick, add 1 tablespoon of Old El Paso™ Spicy Taco Seasoning to the pot. 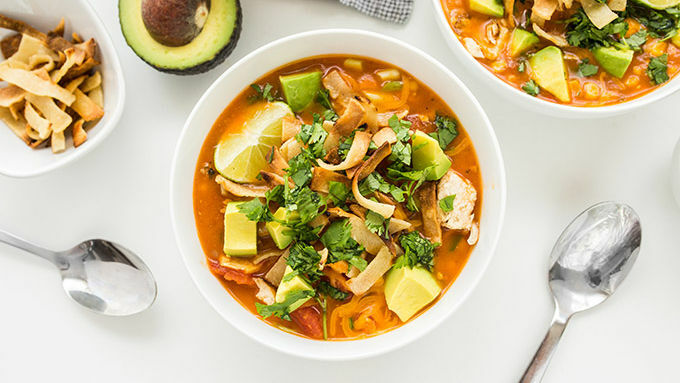 We just adore messing with perfection—like putting this seasonal spin on classic, comforting chicken enchilada soup. There’s this moment when inspiration strikes. You’re standing in the kitchen, all nonchalant. Staring at an uninspirational empty silver pot, dinner on the horizon, a bag of cubed butternut squash in the freezer. You know you should really go with the squash, because veggies and adulthood and all that. But what you really want is creamy, cheesy comfort food, like a warm bowl of chicken enchilada soup. Because who wouldn’t want that every night? And then. Zam zowie. Le inspiration. It hitteth your brainwaves. And you know exactly what to do. First, you grab the blender. Puree the butternut squash with enchilada sauce and chicken broth. Things are off to a promising start. And then, you pour it all into that giant silver pot, and add in other ingredients. You heat it all to piping. And do the happy dance. You pour it into bowls. And it revel over your fine-looking soup. Except… Wouldn’t adding homemade tortilla strips (and cheese, and fresh-diced avocado) make this super just over the top wonderment? You agree. And so you do. And that is how Butternut Squash Chicken Enchilada Soup was born. It’s also how you ended up hot tubbing in a bowl of enchilada sauce for two evenings straight. But that’s a story for another day. The end.